Today I have the privilege of hosting Sunday Stash while Molli enjoys the delights of San Francisco. Don’t panic though he’s due back to resume his duties for Sunday Stash on April 10 – not too long to wait. I’ve done a little bit of stashing recently, but not much. I’m slightly embarrassed about this one; well the fact that I’ve bought fabric to back a quilt that hasn’t been made yet. I’ve had this FQ bundle in my stash for 3 years, it was sent as a gift by Valori Wells, I love it but have not found the right pattern to use it in or is it that I’ve not had the courage to cut it up. 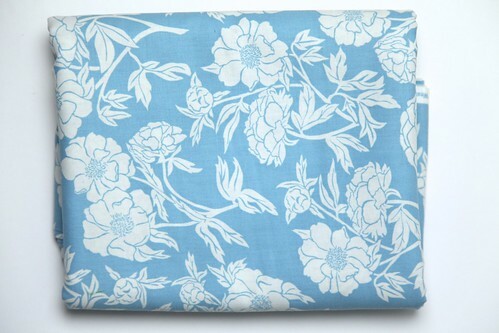 Anyway the lovely Judith has some yardage of this print Peony in teal from the collection in her Etsy shop at a great price so I bought 4 metres of it ready to back the quilt! 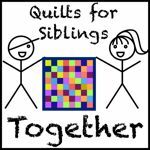 Now I need a plan for the quilt, any suggestions as to what I should do with 18 FQ’s? I would love to see what you’ve been stashing or what you’ve found hidden in your stash that you may have forgotten about (surely it’s not only me who does that!). Please visit some of the other links because as Molli says ‘We want this to be a safe space for sewing supply collectors, after all!’. 1. Leave a comment telling me what fabric you would most like to add to your stash, it doesn’t have to be a new line; maybe something from the past if you missed out on it. 2. Share the giveaway on social media and let me know in a separate comment. 3. Link up your blog post showing your stash additions or stash reflections below and leave a comment saying you did so to qualify for a bonus entry. I’ll ask RNG to pick a winner next Sunday and announce it here. I’ve been waiting eagerly for a Carkai by Carolyn Friedlander fat quarter bundle to arrive with a local seller. Tula Pink, Tula Pink, Tula Pink! I haven’t gotten into shopping online (a slippery slope from the looks of some of the Sunday Stashes) and my LQS doesn’t stoke her. But I’m hoping a trip to the big city next month might help on my quest! Hmmmm… there are so many collections I’d love to get my hands on!! Anything from Sweetwater would be wonderful!! I shared on IG via @winkowl, thanks! I’m loving some of the Cotton + Steel fabrics, particularly the octopus print I’ve seen. I don’t really know any fabric lines so I don’t really know what I’d like to add to my stash (and I don’t have a list), but the backing you’ve just bought from Jude would make it onto the list if I had one! I’ve been stashing Tula Pink and cotton+ steel lately. Need some of the new sun prints too. I linked up my little stash…I’m on the wagon after a month of complete fabric drunkedness! I’ve had and have bundles laying around that I can’t seem to cut up either! I would love to see more Alison Glass Abacus in my stash. I’m not saying I don’t have a little…I just would love more! Thanks for hosting Sunday Stash and the wonderful giveaway! Personally, I have been dreaming of having bolts of solids for my stash. 🙂 Thank you for hosting for Molli while he is away! Since moving house, I’ve been scrupulously working through even the tiniest scraps, so I’d be happy to add absolutely anything to my stash! Cotton and Steel is a huge favourite though… How about a St Louis 16 patch with your 18 fat quarters? It works well as the bigger squares show off the fabrics nicely. Would buy some of that Lucky Strike fabric. I have a bowler friend and this would be perfect. I was on quilting hiatus when Cuzco by Kate Spain came out and I’m sad I missed it. That said, I look forward to stashing her Aria line. I’d like some Katie Jump Rope – I missed out first time round! I have a long list of wants, just about everything I see I want. But if I could get anything I would love to get a full bundle of Saltwater by Tula Pink. I had just gotten back into quilting when that was released, and foolish me did not get any of it. How to choose which fabric to add to my stash??? Anything by Carolyn Friedlander, Brigitte Heitland, Cotton & Steel, the entire Pearl Bracelets line – and that’s just a start! Thanks for the chance to win these gorgeous fabrics! I love all cotton and steel but if I could find any one piece of fabric it would be an older line of Wizard of OZ fabric “there is no place like home” also on from that line that looks line an old story book fabric. Thanks for the chance to win. I love all cotton and steel but if I could find any one piece of fabric it would be an older line of Wizard of OZ fabric “there is no place like home” also one from that line that looks line an old story book fabric. Thanks for the chance to win. Gorgeous stash additions, I like the idea of writing on that print! Thanks for the amazing giveaway! I would love to have more Hope Valley by Denyse Schmidt, I have some that was kindly given to me but it came out before I started sewing. I’m hopeful it will get re-released! I would love to have Moda French General! Shared give away on Pinterest. I’ll be adding Black and White by Cotton And Steel as soon as I allow myself to spend more money on fabric…….its been an expensive on-line shopping weekend! I really really wish I’d bought some of the Ruby Star Rising typewriters by Melody Miller. I do now have some of the cotton and steel black and white ones, but I still wish I had some of the original ones. There are a lot of fabrics that I’d love to add to my stash but I think I’d absolutely love to have Heather Ross’s goldfish in bags print! So many of her prints bring back childhood memories and this is one of them! 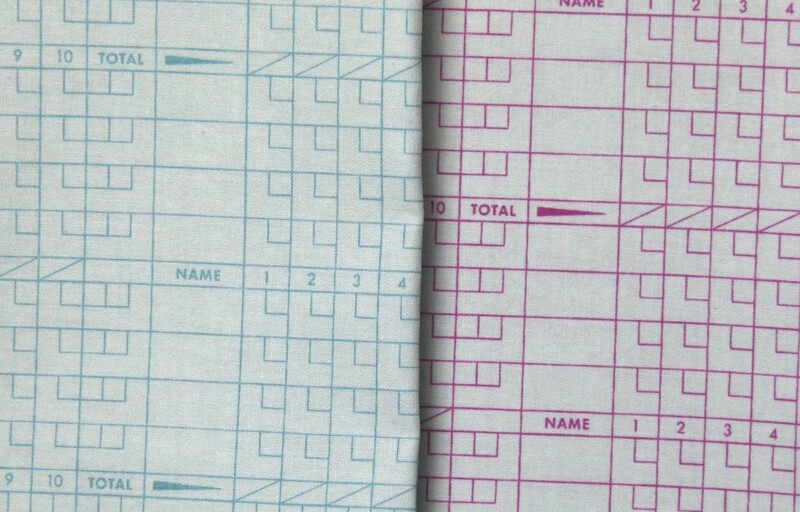 I wish I had known about Carolyn Friedlander when she first started producing fabrics. I still don’t have any of her fabric though. I linked up, I’m number 2 above. Congrats on finding the perfect backing for your quilt! I have admired Kaffe Fassett fabrics for a long time, but have not purchased any. I’m afraid once I do, I’ll just collect more and more of those beautiful prints! I do have other bundles in my stash that haven’t been used….just waiting for the perfect project. I need more batiks of all kinds because I can’t get enough!!!! I’d love to add some Alison Glass Handcrafted fabric to my stash. Just love the colors! Had a similar situation of an FQ bundle hanging out in my closet – just recently ended up using it for the Grand Total APQ quilt-along. It was a perfect fit! Good luck with your endeavor! I have a long list of things I want to add to my stash — so many beautiful fabrics are available! One collection that’s high on my list is Flow by Zen Chic. I would love to add some Strawberry Biscuit fabrics to my stash! I love 30s repros and these are different than any I have already! I have started loving on all the low volume pieces lately. Would love to make a Scrappy quilt from many different pieces. Oh the new Alison Glass SunPrints are haunting me….thanks for sharing! I am in love with Hello Darling right now. I’d love to add anything to my stash. I’m in need of more solids. I would love to get some Sommer yardage for summer sundresses and tops. I am also stalking some of my favorite shops for the new Mendocino (mostly the seahorses in yellow- 2 of my favorite things!). Thank you!! I have never purchased by collections. I always purchase fabrics that speak to me regardless of collection or color, but my preference has always been clear colors, nothing real confusing. Thank you for the chance to win and perhaps make something with a collection. There are so many fabrics I would love to add to my stash, but my most desired would be Saltwater by Tula Pink. I love Ramblings Tone on Tone geometrics in white. I buy them all the time. They go with everything. I missed Katie Jump Rope the first time–I keep thinking I’d better get busy and stash some away or I’ll miss it again and be sorry, because I really love Denyse Schmidt and always appreciate her lines even more with the passage of time. Last year I discovered (a bit late) the Lili-fied line of fabric. At that time it was on its way out. I found a layer cake on sale and I loved every print in the line, which rarely happens. Recently, I fell in love with the Blueberry Park line. I still yearn after some Kumiko Fujita prints from years ago but there’s always more fabric to long for! I tweeted your giveaway Monday lunchtime! I love all things Stonehenge. Thanks for sharing your talents. 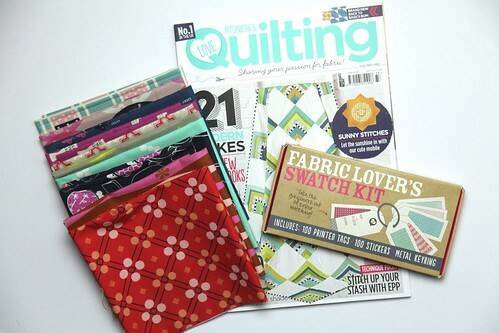 I tweeted your giveaway @mbquilter. Thanks for the giveaway. I would love to add some large print designs from Kaffe Fassett and company to my stash as well as some pale neutrals. Right now I mostly want Gertie’s chambray in aqua dots. I have an urge to do some garment sewing! Loominous by Anna Maria Horner. I love yarn dyed fabric! I have always wished I had some of Heather Ross’s fabric of the goldfish in bags. I love all her illustrations! I am a huge fan of Tula Pink’s designs, and I would dearly love to add a FQ bundle of her Bird’s and the Bee’s to my stash! I love your low volume stash additions, always great to have on hand. I love the Carolyn Friedlander prints old and new. Have a few fat quarters, just wish I had some yardage. Thanks for the giveaway. I am wanting FLOW from moda, I just cannot decide what pattern to make so I keep looking at it and just keep looking at it! BTW, Valori Wells had a pattern for that bundle that makes a very pretty quilt…I think it’s still on her website. I just love all fabric and will use it in a quilt. I have been waiting for Eleanor Burns new fabric line to come our, it’s beautiful and says summer to me. It’s called Forever love. I’d like some Rhoda Ruth, especially the starry ones. Just haven’t got round to ordering any yet. Graet giveaway! I would love to have some of Pat Sloan’s Hometown Girl collection and I really love the new Darlene Zimmerman line. Love the bright colors. They just make me happy. Would love a bunch of Tula Pink! I’ve been on a stashing diet lately, but almost caved twice to buy some Peppered Cottons. I would love some Mendocino by Heather Ross. Thanks for a great giveaway. If I were buying fabric (and I’m not, let me tell you – the size of my stash!!! although a giveaway, yes please ) I think it would be some of Heather Bailey’s Clementine line. I’m a sucker for pretty. I would love some Loulouthi. Between a tight budget and bad timing/when I started quilting, i missed out on this collection. Multi colored and patterned batiks would be great to add to my stash. I’d like to boost my collection of Kaffe Fassett fabrics. I’ve quite a few of his books and would love to recreate the riot of colours in his quilts. It would have to be flannel with child centred designs for the imminent arrival of my first grandchild. I’d like some padstow range by cabbages and roses. It’s an old line and pretty hard to find. 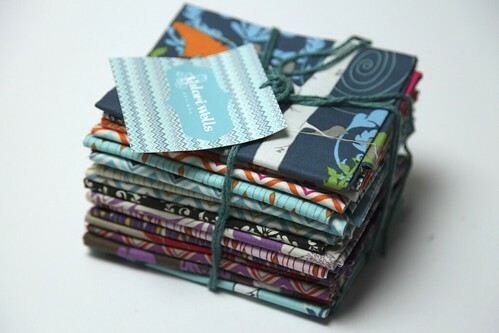 I would like to add some of Lori Holt’s fabric to my stash. I am lacking solids in my stash. I would like to add every line that Anna Maria Horner ever did to my stash. I love her colors ! Thanks for the awesome giveaway. I love these fabrics too! And thanks for your inspiring blog. I would really like some of Patrick Lose basics. He knows color and I like brights. 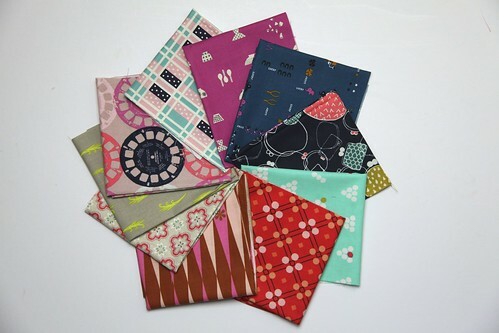 I would like to add some of Mary Fons’ Small Wonders fabrics to my stash! Thank you for the chance to win, winning something is lovely. I’d really like to add some V and Co. Ombre’s to my stash, they are amazing! I’d actually like to add some of my own fractal fabrics to my stash. I sell on several websites but I can’t afford to buy my own fabrics! Thanks and God bless! I didn’t buy any Ruby and so I’m looking forward to Little Ruby. I linked up my very restrained purchases from the Spring Quilt Festival in Exeter. I really like the Blueberry park at the momemt, and low volumes of course!